Unsurprisingly, the majority of the members of the Shakespeare and Company Lending Library lived on the Left Bank. As an umbrella term, the Left Bank or Rive Gauche, refers to several neighborhoods in Paris: the Latin Quarter — named for its many universities, including the Sorbonne; the area south of the Seine at the Louvre, traditionally associated with the publishing industry and the book trade; the wealthy Faubourg Saint‐Germain; and finally Montparnasse, home, in the 1920s and 1930s, to the avant‐garde. 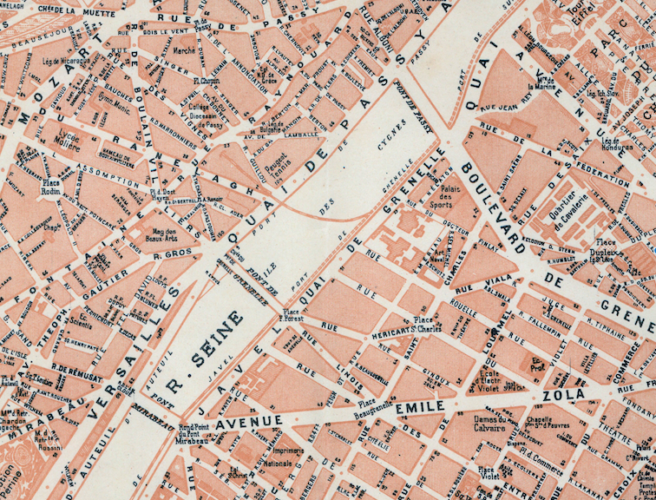 Shakespeare and Company, at 12 rue de l’Odéon, was perfectly located at the intersection of these neighborhoods. The 16th was also home to Paul Valéry, who, as the most celebrated French poet of his generation, was a one‐man literary institution. An early supporter of Shakespeare and Company and Sylvia Beach, he lived in the same apartment at 40 rue de Villejust from 1900 until his death in 1945. That year, rue de Villejust was renamed rue Paul Valéry in his honor. The arrondissement also contained a large assimilated Jewish community, which included lending library members. Henri Maspero, a prominent academic and sinologist, and son of the Egyptologist Gaston Maspero, lived at 45 rue Scheffer. Nathalie Sarraute, a founder of the “Nouveau‐Roman” movement in French letters, lived at 12 avenue Pierre 1er de Serbie. Sarraute got many of her radical ideas for breaking with the French novel from reading the Anglophone modernists she discovered at Shakespeare and Company. The lending library cards are a valuable but imperfect guide for tracking the movements of Shakespeare and Company members. The Lost Generation was a notoriously nomadic community, and it is not unusual to find lending library members with three or more addresses. Archibald MacLeish’s cards, for example, record five addresses in Paris, two in the 16th — 8 rue Emile Augier and 41 avenue Foch — two in the Latin Quarter, and the last at 14 rue Guynemer, next to the Luxembourg Gardens and around the corner from the apartment Hemingway shared with his second wife, Pauline Pfeiffer, at 6 rue Férou. In addition to these locations, MacLeish had forwarding addresses in Cap d’Antibes; Granville, Normandy; the Berkshires; and New York City at 135 East 42nd Street, the offices of Fortune magazine, where he worked in the 1930s. The cards do not represent a precise chronology of MacLeish’s movements. The patronage of wealthy expatriates supported bohemian writers, but it also helped keep Beach’s bookshop and lending library afloat. Notable patrons who lived in the 16th include Carlotta Welles‐Briggs at 31 boulevard Suchet, a Beach childhood friend who eventually married a wealthy banker; and Tania Whitman, at 10 avenue Alphonse‐XIII, the daughter of a prominent San Francisco banking family. The lending library cards with addresses in the 16th also record the names of a surprising number women from aristocratic families: the countesses de Vogüé, de Noailles‐Wendel, de la Foret‐Divonne, and de Raousset, as well as the countess Marthe de Fels, a noted translator who kept a celebrated literary salon at her home at 31 rue Octave Feuillet. The writer Elisabeth de Roos lived with her husband, the Franco‐Dutch aristocrat and writer Edgar Du Perron, at 14 rue de l’Yvette. One of the most intriguing aristocratic women living in the 16th — at 40 rue Spontini — was Elvira de Alvear, an Argentinian heiress, writer, editor, muse to Jorge Luis Borges, and founder, in 1931, of the literary review Imán. “Imán” is Spanish for “magnet,” and as a magazine title refers to the drawing together of north and south literary poles. Not unlike many other modernist little magazines, Imán was ephemeral but influential. It produced one issue only, but was reprinted in four editions and distributed in bookstores in Paris, Madrid, and Buenos Aires. Alvear’s lending library cards include her home address and the address of the editorial offices of Imán at 5 avenue Frédéric‐Le‐Play in the equally posh 7th arrondissement. Noel Riley Fitch, Sylvia Beach and the Lost Generation: A History of Literary Paris in the Twenties and Thirties. New York: Norton, 1985. Nancy L. Green. The Other Americans in Paris: Businessmen, Countesses, Wayward Youth, 1880 – 1941. Chicago: University of Chicago Press, 2014.